Natural moissanite (SiC) is reported from dozens of localities, most commonly from ultramafic rocks where it may be associated with diamond and iron silicides. Yet, formation conditions of moissanite remain in the realm of speculation. The key property of SiC is its extremely reduced nature. 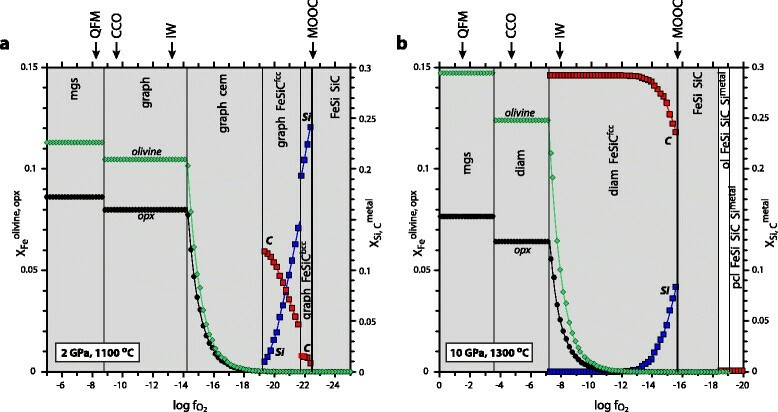 We have experimentally equilibrated SiC with olivine and orthopyroxene at 1300-1700°C, 2 and 10 GPa, to determine the oxygen fugacity of the C + orthopyroxene = SiC + olivine + O2 buffer (MOOC) and the equilibrium X Mg of coexisting mantle silicates. The experiments resulted in olivine and orthopyroxene with X Mg of 0.993-0.998 in equilibrium with SiC and iron silicides. Calculated oxygen fugacities are 5-6.5 log units below the iron-wustite (IW) buffer at 2-10 GPa. The experimental results concur with calculated phase relations for harzburgitic mantle under reducing conditions that include metal alloys, carbides and silicides. 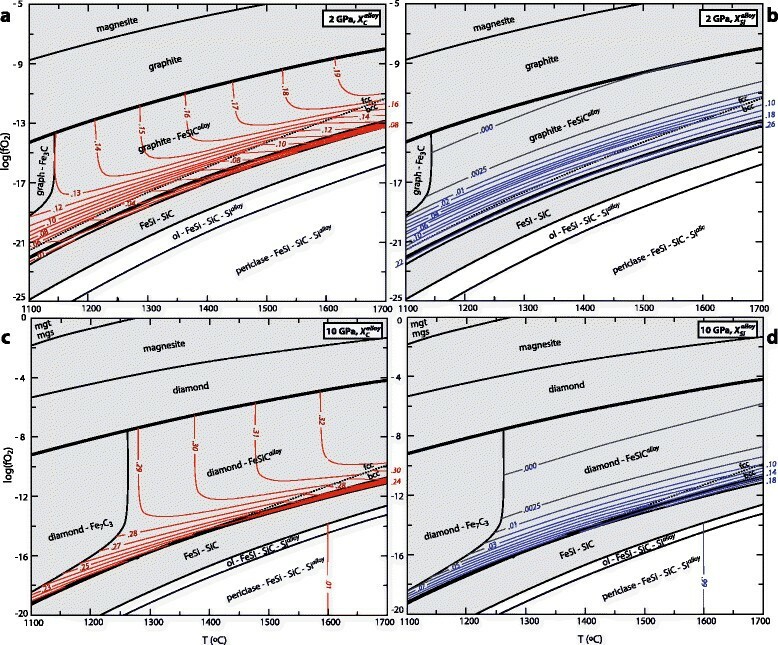 The extremely reducing character of SiC precludes coexistence with silicates with appreciable Fe2+, and hence excludes equilibrium with mantle phases with typical X Mg ’s of ~0.9. Calculated Fe-Mg diffusion lengths reveal that SiC grains of 1 mm would react with the Fe-component of olivine to iron carbide or metal and orthopyroxene within <1 Ma at temperatures above 800°C. We thus conclude that SiC forms through a low-temperature process (<700-800°C) where equilibrium is only reached at the grain scale. The most plausible formation mechanism is a strong fractionation of a C-O-H fluid from metamorphosed sediments originally rich in organic material. Such a fluid is initially saturated with graphite or diamond and is slightly more reduced than the H2O-C join. Fluid percolation in the mantle leads to H2O-sequestration by crystallizing hydrous phases (most likely serpentine, brucite or phase A), and hence O2-removal from the fluid causing its reduction and continuous graphite or diamond precipitation. A small, highly fractionated fluid fraction may then reach CH4 and H2 concentrations that allow SiC formation on grain boundaries without equilibration with the bulk rock on a larger scale. Such a mechanism is corroborated by the strongly negative δ13C of moissanites (-20 to -37), consistent with reduced fluids originating from metamorphosed organic carbon. Moissanite is a refractory mineral stable at extremely reducing conditions with respect to typical Earth environments. Natural occurrences are manifold (Lyakhovich, ; Trumbull et al. ) but many fall into three categories: (i) peridotites, serpentinites (Xu et al., ) and podiform chromitites (Bai et al., ); (ii) kimberlites (Leung et al., ; Shiryaev et al., ); and (iii) metasomatic rocks (Lyakhovich, ; Di Pierro et al., ). In most cases, moissanite is recovered from heavy mineral separates with little textural and phase assemblage information available. Often Fe-silicides or metallic Si are attached to SiC grains (Trumbull et al. ), there are also diamonds which contain moissanite inclusions (Gurney ; Leung, ). The genesis and crystallization conditions of natural SiC remains unclear, nevertheless, agreement exists about the extremely reduced nature of moissanite. This property has led to hypotheses such as moissanite being a remnant from a primordial ultra-reduced mantle or from the core-mantle boundary as discussed by Mathez et al. (). The extreme oxygen fugacities required for moissanite formation have also led to propose extremely high temperatures and/or pressures of formation (Trumbull et al., ), in part motivated by a not uncommon association with diamonds, in part probably motivated by the high temperature synthesis practiced for industrial SiC. As conditions in the upper mantle would not allow moissanite to be stabilized at the predominant oxygen fugacities near the iron-wustite (IW) reference equilibrium (Ballhaus , Woodland and Koch , Frost and McCammon ), moissanite has been hypothesized to stem from the lower mantle (Mathez et al., ). The most basic fact pertinent to moissanite genesis is that the quartz + C = SiC + O2 equilibrium is at oxygen fugacities ≥5-7 log units below those of the iron-wustite buffer (Mathez et al. ; Ulmer et al., ). At such low oxygen fugacities, most Fe2+ should be reduced to metal. Consequently, coexisting mantle phases such as olivine and orthopyroxene should have unusually high X Mg values. Inspiration for the low temperature hypothesis which forms the starting point of this study stems from a moissanite location in a Cenozoic basalt from North China, where SiC appears in mantle xenoliths infiltrated by carbonatites (Gao and Liu, ); these composite xenoliths are in turn erupted by alkali basalts. Clinopyroxene, orthopyroxene and olivine in these xenoliths have average mantle X Mg values near 0.90 and abundant interstitial calcite with no indication for a reduced environment. Nevertheless, moissanite and a panoply of metals (Fe, FeNiSi-alloy, Ti) and Fe-silicides occur in these xenoliths but are constrained to small voids. The close spatial occurrence of an assemblage (i.e. calcite + mantle silicates) requiring oxygen fugacities close to the CCO buffer (graphite/diamond-CO-CO2, i.e.) with another assemblage requiring oxygen fugacities 10 log-units below this buffer motivates the formulation of a low-temperature hypothesis. In this model, the SiC in the voids would be precipitated from an ultra-reduced highly fractionated fluid that is not in equilibrium with the adjacent silicate and carbonate phases of the xenolith itself. In this study, we demonstrate experimentally that olivine and orthopyroxene in equilibrium with SiC are almost purely magnesian, containing only 2-7‰ of their Fe-endmembers. Consequently, close spatial association of moissanite and silicates with X Mg ≤0.9 demonstrates chemical disequilibrium and indicates temperatures lower than those allowing for diffusional equilibration. Secondly, we combine thermodynamic data for Si- and Fe-carbides, stoichiometric FeSi-compounds and FeSiC alloys with silicate data to compute P-T-f O2 phase relations, phase compositions and hence the stability of moissanite for an Fe-Mg-Si-O-C peridotitic bulk composition. One set of experiments reacted San Carlos olivine (X Mg = 0.90) and a natural orthopyroxene from the Urals (X Mg = 0.91) with SiC at 2 GPa, 1300 and 1500°C; and at 10 GPa, 1500 and 1700°C (Table 1). The 2 GPa experiments were performed in an endloaded, 14 mm bore diameter piston cylinder employing a talc–pyrex–graphite-MgO assemblage. The 10 GPa experiments were performed in a multi anvil employing 18 mm Cr2O3-doped MgO-octahedra on a 11 mm truncation. The multi-anvil assemblage contained a zirconia insulator, a stepped LaCrO3 furnace, inner MgO pieces, and a Mo ring and disc between the furnace and WC cube truncation faces. In both apparatus B-type PtRh thermocouples were used. In experiment G#1 we intended to monitor oxygen fugacity by using an Ir sensor (Woodland and O’Neill, ), but a ternary Fe-Si-Ir alloy resulted for which thermodynamic data are not available. *Rims or silicide-free exsolution zones of previously San Carlos olivine too small to measure by EMPA. **From equilibrium (1), the FeSi is most likely formed metastably in the early stage of the experiment. A second set of experiments intended to synthesize SiC first at low temperature from tetrakis-silane (((CH3)3Si)4Si) or stearic acid (C18H36O2) and olivine + serpentine or talc + MgO at 500°C, 0.2 GPa. These experiments did not result in SiC or equilibrium assemblages. We then aimed at synthesizing SiC + magnesio-silicates at 1000-1600°C, 2-10 GPa employing talc + MgO and tetrakis-silane as starting materials. At 6 GPa, 1300°C we obtained SiC + olivine + opx, but the assemblage was unequilibrated with strong compositional zoning in the silicates and further experiments in this direction were abandoned. Thermodynamic databases suited for calculating phase equilibria in Earth sciences mostly contain only silicates and oxides. In order to perform calculations in mantle materials at ultra-reduced conditions, alloys, carbides and silicides were combined with silicate data from Holland and Powell (). The data sources employed were: Cementite (Fe3C): calorimetric data from Gustafson (), volume data from Li et al. (), Wood et al. (); Fe7C3: Djurovic et al. (), Mookherjee et al. (), Nakajima et al. (), Moissanite (SiC): Lacaze and Sundman (), Miettinen (), Aleksandrov et al (), Li and Bradt (). The FeSiC-alloy and the iron silicides are based on the 1-atm phase diagram by Lacaze and Sundman () and on the volume EoS of Brosh et al. (). Details of the adoption of the ternary metal, carbides and silicides are given in a forthcoming paper (Golubkova et al. ). Phase relations were computed by free energy minimization with the Perple_X software package (Connolly JAD ). Experiments at 2 GPa, 1500°C (G#2) and 10 GPa, 1700°C (G#6) resulted in equilibrated olivine + orthopyroxene + SiC plus iron silicides (Table 1, Figure 1). 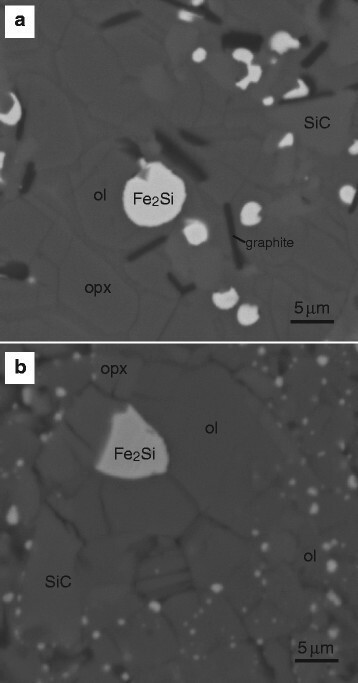 The experiment at 10 GPa, 1500°C (G#3) resulted in coarse opx + SiC plus three iron silicides (FeSi, FeSi2, and FeSi4) and olivine that did not develop equilibrium rims large enough for measurement. These charges did not contain any residual silicates from the starting material, but in both the 1500°C and 1700°C experiments at 10 GPa, most of the San Carlos olivine disintegrated to an almost Fe-free olivine containing many submicron iron silicide inclusions (Figure 1b). These inclusions are too small to determine their stoichiometry. The equilibrium X Mg of olivine and opx in these experiments are 0.993-0.998 (Table 1). Initially, we added Ir metal as internal oxygen fugacity monitor (Woodland and O’Neill, ; Stagno and Frost, ), this experiment (G#1) at 1300°C, 2 GPa yielded opx (X Mg = 0.982) and quartz. However, abundant residual starting material San Carlos olivine testifies for incomplete equilibration questioning whether the X Mg of the opx of this experiment corresponds to equilibrium with SiC. We have thus only used experiments #2, #3 and #6 for oxygen fugacity calculations. BSE images of run products from (a) experiment G#2 (1500°C, 2 GPa) and (b) experiment G#6 (1700°C, 10 GPa). Olivine and orthopyroxene have XMg > 0.99 and cannot be well distinguished from each other. Note the graphite flakes at 2 GPa. At 10 GPa diamonds result mostly in plug-outs during preparation and are hence rarely visible. Note that in (b) the original San Carlos olivine forms almost pure forsterite with many Fe-rich inclusions which stoichiometry cannot be determined due to their small size. For the experiments, which yielded iron silicides and equilibrium compositions of olivine and orthopyroxene, oxygen fugacities were calculated from equilibrium (1) and (2), employing the olivine and orthopyroxene activity formulations from O’Neill and Wall (). log f O 2 = G fs P , T + G graph / diam P , T − G fay P , T − G SiC P , T − G O 2 P , T 2.3025 R T − log a fay olivine + log a fs o p x .
SiC and graphite or diamond being pure phases. The resulting oxygen fugacities are log f O 2 = − 15.1. (6) or Δ log f O 2 I W = − 6.4 . at 2 GPa, 1500°C (G#2), and log f O 2 = − 10.6 (4) or Δ log f O 2 I W = − 5.6 at 10 GPa, 1700°C (G#2). To understand the succession of phase assemblages with decreasing oxygen fugacity, we calculated f O 2-temperature diagrams (Figure 2) and phase compositions (Figures 3 and 4) for a model harzburgite at 2 and 10 GPa. For reference, we also give the quartz-fayalite-magnetite (QFM), the graphite/diamond-CO2-CO equilibrium (CCO), and the iron-wustite buffer (IW), even if these do not occur as reactions in the harzburgite phase diagram. The position of the iron-wustite buffer is calculated from Campbell et al. (), which yields about half a log-unit lower values than the formulation of O'Neill (). Calculated f O 2 -temperature diagrams for carbon-bearing harzburgitic peridotite simplified in Mg-Fe-Si-C-O 2 at (a) 2 GPa and (b) 10 GPa. The saturation hierarchy at moderately oxidizing conditions is chosen as olivine > orthopyroxene > graphite/diamond > magnetite. The FMQ, CCO and IW buffers are given for reference. Squares are calculated oxygen fugacities for the experiments, red fill for f O2 ’s calculated from the iron silicide involving equilibria (1) and (2), black fill for f O2 ’s calculated from the SiC-involving reaction (7). Isopleths of olivine composition in terms of X Mg in the same harzburgitic bulk composition as in Figure 2 for (a) 2 GPa and (b) 10 GPa. Within two log-units of the metal forming reaction, X Mg olivine increases to 0.99, when reaching the SiC-buffer, olivines are essentially Fe-free. X Mg olivine is almost constant in the stability fields of magnesite or graphite/diamond. The grey field corresponds to olivine + orthopyroxene saturation and only additional phases are indicated. Isothermal composition – f O2 sections at (a) 2 GPa, 1100°C and (b) 10 GPa, 1300°C. At oxygen fugacities below the carbide- or metal–forming reaction, X Fe olivine drops rapidly to per mill values. The grey field corresponds to olivine + orthopyroxene saturation and only additional phases are indicated. With decreasing oxygen fugacity the FeSiC-alloy becomes more and more Si-rich, leading to the fcc-bcc phase transition and then to iron silicide stability. Note that the Si-alloy formed orthopyroxene and olivine breakdown is essentially pure Si with 1 mol% C and almost no iron. The calculations are done at discrete f O2 -values represented by symbols; green: X Mg olivine , black: X Mg opx , red: C content in metal alloy, blue: Si-content in metal alloy. where FeSiCalloy is a ternary metal solid solution. The stoichiometry of reaction (11) depends on the alloy composition. The molar fraction of C in the alloy ranges from 0.13 to 0.33 at 2-10 GPa, 1150-1700°C. At oxygen fugacities of initial metal formation, Si-fractions are <0.1 mol% in the alloy. For a graphite/diamond saturated mantle with a bulk X Mg of 0.9, reactions (10a, 10b) and (11) occur at 2 GPa about one log-unit below the iron-wustite buffer and about one log-unit above IW at 10 GPa (Figure 2a,b). About 5-9 log-units below the carbide-forming reactions, increasing chemical potential of Si leads to the replacement of Fe3C or Fe7C3 by the FeSiC-alloy then containing significant Si (Figure 5b,d). Silicon contents in the alloy increase with decreasing oxygen fugacity leading to a phase transition from a face centered to a body centered metal structure (fcc and bcc in Figure 5). Calculated isopleths of metal composition for the ternary FeSiC alloys at 2 and 10 GPa. (a) and (c) C-content in mol-fraction; (b) and (d) Si-content in mol-fraction. Note the phase transition from the fcc to bcc alloy structure with increasing Si-content when decreasing oxygen fugacity. At the metal-forming reaction, C-contents increase with temperature and decrease with pressure, Si contents are below the lowest increment of the calculations. At 2 GPa, calculated C- and Fe-contents of the Si-alloy stable at ultra-reducing conditions are <1 mol%. Grey fields correspond to olivine+opx saturation. at 2 GPa at 7.7-4.8 log-units (1100-1700°C) below equilibria (10a, 10b) and (11). At 10 GPa this difference is 9.9-6.5 log units (1100-1700°C). This corresponds to a Δlogf O2 of IW-9 to IW-6, the difference decreasing with temperature. Along a mantle adiabat, moissanite forms at IW-8.0 at 2 GPa and at IW-6.7 at 10 GPa. Reaction (12) was previously identified as being responsible for the appearance of moissanite in the upper mantle (Mathez et al. ; Ulmer et al. ). where the Si-alloy has 1 mol% C. Completion of reactions (13) and (14) would leave no oxidized Si. The calculations do not indicate any Fe in the Si metal and only 0.2 to 1.3% C. Reaction (13) is relevant in nature as pure Si-metal attached to SiC has been reported by Trumbull et al. (). Summarizing, a harzburgitic mantle would have the following succession of reduced phases: graphite/diamond → (Fe3C/Fe7C3) → Fe-rich FeSiCalloy → SiC → FeSi → Sialloy. At pressures ≥10 GPa, FeSi may form before moissanite. Note that our calculations do not include liquids and that at high temperatures FeSiCalloy and FeSi become metastable with respect to liquid. This is of particular relevance at oxygen fugacities just below the metal-forming reaction (11) where a de facto binary FeC-alloy is almost Si-free. The Fe-C eutectic is located at 1150°C, 1 atm (Chipman ) and 1210°C, 10 GPa (Hirayama et al. ; Rohrbach et al. ), although this location is not entirely unambiguous as Lord et al. () report the eutectic at 10 GPa at 1420°C. In a graphite/diamond-saturated system, the ternary FeSiC-alloy would then be replaced by a metallic melt phase. FeSi has a temperature of congruent melting of 1410°C at 1 atm (Lacaze and Sundman ), but to our knowledge its high pressure melting is unknown. The above reactions are discontinuous reactions that delineate the various stability fields. For the silicate mantle the continuous reactions consuming the fayalite and ferrosilite components in olivine and orthopyroxene are more dramatic. As illustrated in Figures 3 and 4, X Mg in olivine is almost invariant in each field of coexistence with magnesite or graphite/diamond. Immediately below the metal forming reaction, Fe2+ becomes strongly reduced, within only 2 log-units, the X Mg of olivine (and similarly opx) in equilibrium with metal or Fe3C/Fe7C3 and graphite/diamond increases to ~0.99 (Figures 3 and 4). When oxygen contents corresponding to the oxygen fugacities of SiC are reached, the equilibrium X Mg in the silicates is >0.999, almost invariant with pressure and temperature (at least for 1100-1700°C, 2-10 GPa). This confirms the experimental findings. Concomitant with the increase in X Mg of the silicates, an increase of the Si-content of the FeSiC-alloy is predicted (Figures 4 and 5), mirrored by a decrease of X Fe metal from ~0.90 to 0.70 at 2 GPa and from 0.76 to 0.66 at 10 GPa. A major question concerning the stability of SiC in the mantle regards the evolution of the difference in oxygen fugacity between the metal or Fe-carbide forming (10a, 10b, 11) and the SiC-forming reactions (12). This difference, Δlogf O 2 (12)-(10a,10b,11), decreases with increasing temperature but at near-adiabatic temperatures only by -0.1 log-units per 100°C. With increasing pressure there is a slight increase of Δlogf O 2 between the moissanite forming reaction and the equivalent of IW in the mantle such that along a mantle adiabat Δlogf O 2 (12)-(10a,10b,11) remains almost constant at ~ -4.5. In Figure 2a and b we plot the oxygen fugacities calculated for the three experiments with olivine and/or orthopyroxene equilibrated with SiC. The oxygen fugacities calculated from the experiments through the moissanite-forming equilibrium (7) are in perfect agreement with the calculated phase diagram. They are also in good agreement with the values derived from Ulmer et al. () from experiments on a Mg-Si-C-O system that cross-compared equilibrium (12) at 1500°C to other common oxygen buffers. Oxygen fugacities from the iron silicide involving equilibria (red symbols) were calculated without involving SiC and may hence be taken as independent confirmation of the f O2 -value of the SiC-forming reaction. Nevertheless, the interpretation of the silicides in the two experiments at 1500°C is not straightforward. Congruent melting of Fe2Si occurs at 1212°C at 1 atm, but the dP/dT slope of this reaction is unknown. It is thus well possible that the Fe2Si in the 2 GPa experiment G#2 crystallized upon quench from a FeSiC-liquid. At 10 GPa, the silicides should be stable as solids. Nevertheless, the experiment at 1500°C (G#3) contains three silicides, FeSi, FeSi2 and FeSi4. Together with opx, diamond and SiC, these are six phases, one phase too much for a divariant field of a five component system (Mg-Fe-Si-C-O), but possible if Ni is also accounted for as a component. Nevertheless, one of the silicides may well form in a transient stage, when the FeO of the fayalite component is reduced. We interpret the f O2 -value calculated from equilibrium (1) as reflecting a transient stage at the beginning of the experiment. The results from the experiments in terms of X Mg of silicate minerals coexisting with SiC agree very well with the calculated phase compositions (Figures 3 and 4). Together with the constraints on oxygen fugacity, a coherent picture forms: moissanite can only be expected in a mantle or any rock with silicates essentially devoid of Fe2+. This unsurprising finding has strong implications for the origin of SiC in mantle rocks. It demonstrates that any significantly large domain of mantle at oxygen fugacities of SiC-stability (i.e. void of Fe2+ in silicates and oxides) has not yet been identified. Both the experiments and the calculations demonstrate that for plausible mantle compositions with SiC stable, the X Mg of coexisting olivine or orthopyroxene is >0.993. Hence SiC cannot be in equilibrium with typical mantle that has olivine and pyroxenes with X Mg of 0.88-0.92. The experiments only constrain the X Mg of olivine and orthopyroxene in equilibrium with SiC. Nevertheless, in nature, X Mg of serpentine is generally higher than that of coexisting orthopyroxene, which is similar to that of clinopyroxene and X Mg of olivine is lowest among these phases. One can thus safely assume that for all silicates characteristic for peridotites (except of garnet) similarly high X Mg of >0.993 are to be expected. As SiC is found in mantle rocks and kimberlites from which anomalous X Mg values for the silicate phases are not reported, the formation mechanism of SiC should explain how average X Mg mantle silicates and SiC persist in the same rock volume. Considering a SiC grain within a matrix of FeMg-silicates, one can calculate the time scale for diffusive equilibration between SiC and the FeMg-silicates. With time, SiC would react with the fayalite component of olivine to form opx and metal or carbide until the SiC grain is completely consumed. Taking a putative SiC grain in a matrix of otherwise undisturbed mantle silicates, Fe-Mg diffusion coefficients of the silicates allow for calculation of the time-temperature conditions for which a given grain size of SiC would react with olivine until its complete destruction. Assuming spherical symmetry, the amount of Fe2+ needed to oxidize all Si of a SiC grain in an olivine (Fo90) matrix occurs within 2.3 radii. Fe-Mg volume diffusion in olivine and orthopyroxene are characterized by diffusivities of D0 = 10-7 m2/s and an activation energy E A of 250 kJ/mol (Brady and Cherniak, ). We have calculated the relation between time and temperature for a given grain size of radius r employing the characteristic diffusion length 2.3r. This calculation yields the time necessary to diffuse a sufficient amount of Fe2+ towards a SiC grain, then being consumed and forming orthopyroxene (and metal), for a given temperature and grain size (Figure 6). These calculations show that mm-sized grains would disappear through diffusive equilibration within a million years at temperatures above 800-900°C. 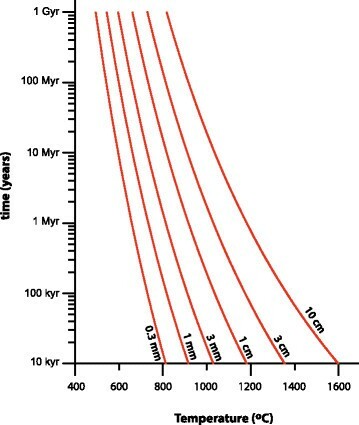 Preservation of SiC in a mantle mineral matrix with XMg = 0.9 would not be possible at adiabatic mantle temperatures, even SiC grains of 3-10 cm would only last for 10’000 years. This conclusion remains robust when employing the experimentally determined range of D 0 – E A pairs (for summary of diffusion data see Brady and Cherniak, ). Illustration of the diffusion time – temperature – grain size relation for SiC in an olivine matrix with X Mg = 0.9. For a given grain size, this graph illustrates the time of SiC decomposition through diffusive equilibration with the Fe-component in olivine, effectively delimiting the temperature at which SiC could reside in a mantle with X Mg = 0.9. For details see text. These time spans could be prolonged if SiC forms in veins of essentially Fe-free silicates, but such mineral compositions are not reported for peridotites or kimberlites. Regarding the putative high-temperature origin of SiC, at temperatures of the asthenospheric mantle, SiC grains of initially >50 cm would be necessary to persist for >1 million years. It is thus unlikely that SiC would survive any period of sustained high temperatures in the mantle. COH-diagrams for fluids illustrating the graphite saturation surface (a) and with calculated graphite-saturation surface and oxygen fugacitiy values and isopleths for 2 GPa, 900°C (b) and 2 GPa, 700°C (c). The solid line traversing the diagram represents the graphite-saturation surface, possible fluid compositions plot below. The CCO-buffer locates per definition where the graphite-saturation surface intersects the C-O side of the triangle. Note that in nature, we do not expect fluid compositions with significantly more oxygen than the H2O-CO2 tie-line, rendering the field of oxidized geological fluid compositions extremely narrow, in fact graphically almost not resolvable at 700°C. The red numbers give oxygen fugacities (in log-units) on the graphite saturation surface (a C = 1), the blue numbers on the H2O-CO2 tie-line approximated by a C-activity of 10-6, the green numbers those between H and H2O. Almost the entire width of fluid compositions on the graphite-saturation surface spans a relatively small range in oxygen fugacities equivalent to CCO to IW. More reducing fluids are all on the H-rich side of possible fluid compositions, essentially within a X O fluid of 0.01. The star in (b) indicates a putative fluid from an organic rich sediment that also has some CO2; to drive this composition to the reducing side, CO2 has to be removed from the fluid in carbonates. Magnesite and dolomite are only stable to oxygen fugacities of the H2O-maximum (the inflection in the graphite-saturation surface), but calcite until an approximate logf O2 of -15 (900°C) or -19 (700°C). Fluids from carbonate-free organic-rich sediments are expected to lie on the graphite/diamond saturation surface on the H-side of the H2O-C tie-line, as indicated by the star in (c). These fluids move away from H2O, on the graphite-saturation surface co-precipitating graphite or diamond, if reaction with peridotite produces hydrous phases (phase A at high pressure, serpentine or brucite at low pressure). Eventually such fluids would become more reduced than the IW buffer and would possible reach a H:O ratio of >1000 necessary to precipitate SiC. Note that there is no direct proportionality between oxygen fugacity and X O fluid . 1a) Starting from fluids with some CO2, the precipitation of carbonates through reaction of the fluid with silicates (e.g. olivine + CO2 = opx + magnesite; or cpx + olivine + CO2 = calcite + opx) removes oxygen from the fluid, causing the fluid composition to evolve away from CO2, the star in Figure 7b representing a hypothetical starting composition. 1b) Alternatively, fluid percolation in mantle rocks may lead to the formation of magnetite component in spinel and hence consumption of oxygen from the fluid. 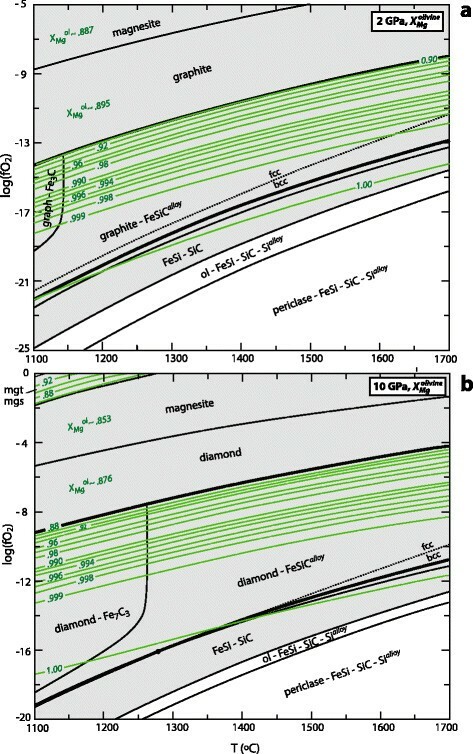 This would lead to co-precipitation of graphite/diamond and the rising fluid would evolve towards the left along the graphite/diamond saturation surface of Figure 7. In both cases, the fluid could only evolve to more reducing compositions if it leaves the zones of carbonate or spinel formation behind. If the initial fluid composition is at H:O <2, steps 1a or b would need to fractionate the fluid composition to H:O >2. Any fluid initially already to the H-rich side of the H2O-graphite/diamond tie-line or H2O-maximum (fluids are mostly H2O at the inflection of the graphite saturation surface, Figure 7) would evolve towards more methane-rich compositions by removal of H2O from the fluid. This can easily be achieved by the precipitation of hydrous phases when the fluid percolates through mantle rocks. In peridotitic compositions, such hydrous phases could be hydrous alphabet phases at higher pressure, otherwise humites, serpentine, brucite or talc. Removal of H2O from the fluid forces the fluid to evolve along the graphite/diamond saturation surface continuously precipitating graphite/diamond concomitantly with the formation of hydrous magnesium silicates. Note that step 2 requires temperatures within the stability fields of these phases, which, in equilibrium with olivine, for the most part do not exceed 700-800°C (Fumagalli and Poli, ). Finally, still fractionating e.g. serpentine or brucite, such fluids could reach oxygen fugacities of IW-5 to IW-8 where SiC and Fe-silicides become stable. Note that the compositional change in the fluid from moderately reducing conditions near the IW-buffer to ultra-reducing conditions that allow for SiC formation is small in terms of X O , and is graphically not resolvable in the C-O-H ternary. This final step of fluid fractionation occurs very close to the intersection of the graphite-saturation surface with the C-H sideline (Figure 7). The simplest case enabling SiC formation is to start with an aqueous fluid that contains more methane than CO2 (molar), i.e. with a bulk composition more reducing then the H2O-maximum. Sequestration of oxygen from the fluid by hydroxide minerals would then directly lead to extremely reducing conditions. In mantle compositions, serpentine or brucite are only stable at relatively low temperatures (<700°C) as could be expected for fluid-percolation in supra-subduction mantle or during orogenic metamorphism. In fact, SiC has been reported from serpentinites (Xu et al. ). Moissanite accounting for 8% of a rock with a bulk X Mg = 0.998 has been reported from a beach pebble which matrix is brucite-dominated (Di Pierro et al. ). This latter rock contains minor (remnant) chromite and orthopyroxene of typical mantle composition and may represent a completely metasomatized peridotite. Otherwise, moissanite is rare in most rocks and mostly described from heavy mineral concentrates. Phases grown with or onto moissanite are Fe-silicides, Si- and other metals. Unfortunately, the textural context and relations to silicates remain mostly unknown providing little evidence for the type of reactions leading to moissanite. Step 3 is likely to occur through grain scale equilibria where new hydrous minerals form in equilibrium with the fluid but where the bulk rock is in disequilibrium with this fluid. Alternatively, discrete metasomatic zones could host SiC and hydrous phases as in the rock from Turkey described by Di Pierro et al. (). As SiC is a rare mineral, it appears likely that in most cases either reduced fluids are consumed before extreme fractionation or fluid:rock ratios in percolation zones are too high to change fluid-compositions much. However, when such prolonged fractionation occurs, C-O-H fluids may fractionate to H:O ratios sufficiently high for SiC-precipitation. Although the mantle wedge is generally thought to be rather oxidized, evidence for a fairly reduced mantle wedge has been reported for xenoliths from the Avacha volcano, Kamtchatka (Ishimaru et al. ). The bulk of minerals in these peridotite xenoliths equilibrated at 870-1040°C and oxygen fugacities of ΔQFM = -0.2 to +1.5, and most silicates have XMg values characteristic for the mantle. Nevertheless, some xenoliths contain small amounts of Ni-, Fe- and possibly Ti-metal and Ti-rich Fe silicides mostly along grain boundaries. Serpentine is absent in these xenoliths. The sporadic occurrence of metal and silicides are ascribed to a reducing fluid phase with oxygen fugacities ≤ IW that causes precipitation of the reduced phases under disequilibrium with the host rock. Exact temperatures could not be determined but are suggested to lie below the bulk equilibration temperature and serpentine stability (Ishimaru et al. ), probably between 700 and 900°C. Natural moissanites have a light carbon isotopic composition of δ13C = -20 to -37‰ (Mathez et al. , Trumbull et al. ). Generally, the main source material for such light compositions is organic matter typically reaching down to -30‰. Upon burial and heating through subduction or orogenesis such organics will generate fluids with low δ13C. However, the relation between the original fluid composition and the δ13C of precipitated SiC is not straightforward: The fluid evolves to ultra-reduced compositions through removal of H2O by hydrous phases, this process is necessarily accompanied by graphite or diamond precipitation (see Figure 7). Poulsen () calculated a fractionation factor Δ13Cgraphite-CH4 of +1 to +5‰ (750 to 500°C) and hence graphite fractionation renders an already reduced fluid lighter. On the other hand mixing of the fluid with mantle carbon of δ13C ~ -5‰ (Deines ) would lead to heavier compositions. 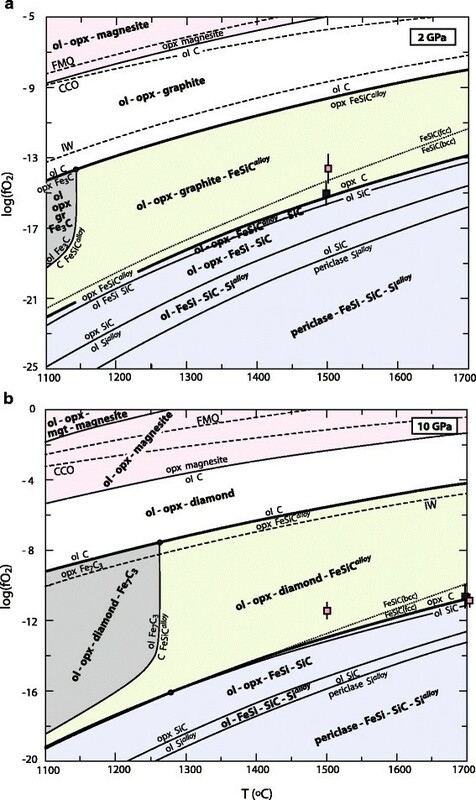 Nevertheless, Deines () points out that the light carbon mode of mantle samples of δ13C ~ -20 to -25‰ is not necessarily solely related to surface carbon, also the fractionation factor Δ13CSiC-CH4 remains unknown. Hence a quantitative model is difficult, but the light isotopic carbon composition of moissanite supports an involvement of initially reduced fluids probably originating from organic material. Moissanite is reported from kimberlites (e.g. Shiryaev et al. ) which contain light 13δ C diamonds (Trumbull et al. ), but their direct paragenetic association remains uncertain (Gurney ). In one case, SiC was described as part of a complex inclusion in diamond (Leung ), the latter effectively halting diffusive equilibration with the surroundings. Moissanite could survive millions of years in the sub-lithospheric cratonic mantle at low temperatures (<800°C). In principle, the same fluid or melt that leads to diamond formation could also precipitate SiC in a later more fractionated stage, which should occur at shallower pressures and lower temperatures. Regardless of these observations, as kimberlites are CO2-rich magmas whose eruptions are propelled by CO2, it is not possible that the kimberlite magma would be equilibrated with SiC. Hence, moissanites in kimberlites represent xenocrysts, the kimberlites sampling cold and reduced parts of lithospheric mantle keels. To appreciate the amount of oxygen to be removed from a given mantle volume to attain oxygen fugacities of the SiC-buffer, the following mass balance is at order: To move a graphite-bearing mantle (with 8.0 wt% FeO) from just below the CCO-buffer (logf O2 = -8.5 or ΔIW = +3.3; all values for 2 GPa, 1200°C) to the metal-forming reaction (logf O2 = -12.9 or ΔIW = -1.1) where a few per mill of metal form, about 0.05 wt% O2 have to be removed from the rock. To further move a mantle volume to just above the SiC-buffer (logf O2 = -20.1 or ΔIW = -8.3), where essentially all Fe2+ is reduced to Fe0 and where the metal contains about 26 mol% Si, a total of 2.82 wt% O2 have to be removed. This is equivalent to 6.4 wt% relative of the total oxygen contained in the mantle volume considered, making it hard to imagine how such a process could possibly operate on a large scale. To remove such an amount of oxygen, an extremely high fluid/rock ratio would be required (as ultra-reduced fluids have little oxygen); this is most easily realized if only very small rock volumes in a zone of high fluid throughput are reduced to oxygen fugacities of the SiC-buffer. In the mantle, there is little change in oxygen content between oxygen fugacities just below the olivine-opx-magnetite equilibrium to the olivine-opx-metal equilibrium (i.e. the equivalents to the magnetite-quartz-fayalite (QFM) and iron-wustite (IW) buffers in peridotites), followed by a large change in oxygen content with reduction to the olivine-opx-C-SiC buffer. Exactly the contrary is true for COH-fluid. A fluid from graphite-saturated sediments could have e.g. 20 mol% CO2 and a X O fluid (=molar O/(H + O)) of roughly 0.75 (Figure 7). Its oxygen fugacity would be 0.6 to 1.3 log-units below QFM or ΔIW = +5 to +3.5, (all values for 700-900°C, 1 GPa). In order to evolve to an oxygen fugacity just above the IW-buffer which locates at X O fluid of 0.004 to 0.011 on the graphite-saturation surface, almost 99% of the fluid’s oxygen needs to be removed. To further move to a fluid composition that would be in equilibrium with SiC, X O fluid becomes 0.001, which composition-wise is only a small step. In summary, oxygen fugacity has no simple proportionality to the oxygen content of a rock. In particular, oxygen fugacity is not a parameter that can be freely varied, one has to carefully consider which changes in oxidation state (mostly of Fe and C, but in this case also Si and Cr) and bulk composition of the rock volumes under consideration are involved. 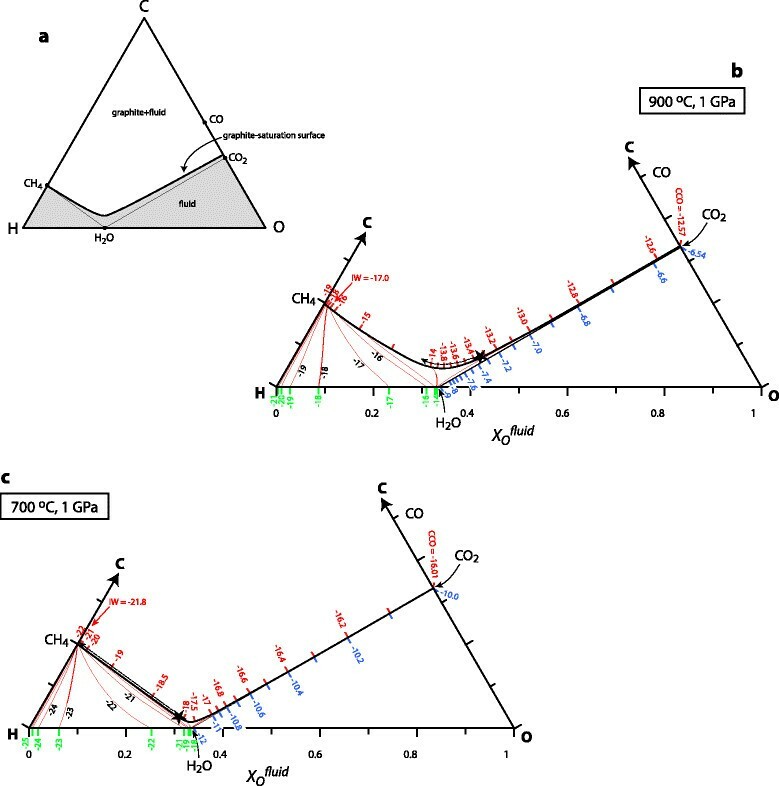 Mantle silicates in equilibrium with natural moissanite have X Mg values of >0.993, SiC forming only 4.5-6 log units below the IW reference buffer. Large volumes of peridotite with such mineral compositions are unknown, hence, SiC forms locally in disequilibrium with the bulk rock and does not reflect large scale modifications of oxygen contents in the mantle. SiC cannot be in equilibrium with minerals that have typical average mantle X Mg of 0.88-0.92. As Fe-Mg diffusion in silicates is generally fast, SiC could not survive at adiabatic temperatures in the mantle for any reasonable time span (i.e. >100’000 yrs) hence precluding any high temperature (>1000°C) origin of natural moissanite. Consequently, any primordial, core-mantle boundary or lower mantle origin for SiC can be ruled out on the basis of the temperatures involved. Nevertheless, natural moissanite does yet not directly indicate any particular pressure of formation. We conclude that SiC forms through a relatively low temperature mechanism (<700-800°C) and identify this mechanism as percolation of ultra-reduced fluids. Such temperatures in mantle rocks are only realistic in the subduction realm or during orogenesis. Suitable fluids may originate from sediments rich in organic matter. These fluids evolve from moderately reduced compositions through progressive removal of the oxidized species H2O through hydrous magnesium silicates, which form through reaction with the host rock during fluid percolation. After >99% fractionation, such fluids may reach H:O ratios of ~1000 that stabilize SiC. Such extreme fractionation is obviously rare but may occur occasionally. The initial fluids are expected to form upon heating of sediments, this could occur in the subduction realm, but also during orogenic burial, possibly precipitating SiC in ophiolitic peridotites upon orogenesis. The experiments of this study were performed while C.Gao visited ETH with the State Sponsored Study Abroad Program by the Chinese Scholarship Council. A. Golubkova was supported through SNF grants 200020-140541/1 and 200020-153112/1 to MWS. All authors contributed equally to the study, have read the manuscript and approved the final version.